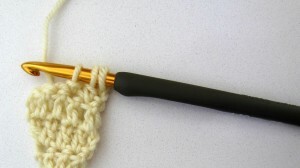 Knowing how to increase and decrease can open up a whole new world in crochet. 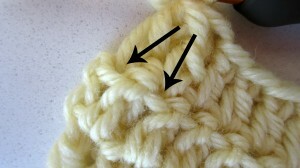 Increases are formed when you crochet more than one stitch in the same chain, stitch or space. 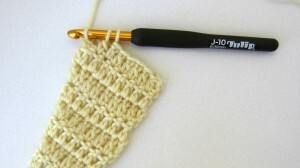 Decreases are formed by skipping stitches or working two or more stitches together. You can increase or decrease to alter the total number of stitches in each row or round, such as increasing to add stitches to a round in a granny square or decreasing to shape the waist on a garment. You can also balance increases and decreases in a project to keep the total number of stitches the same while altering the shape, such as when crocheting shells or chevrons. The Spring Shawl uses increases to add stitches to form the first half of the triangle shape, and then it uses decreases to reduce stitches to form the second half of the triangle. To increase, work the first stitch as usual. 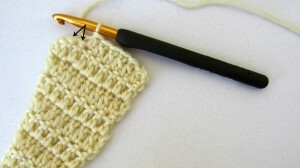 Then, add another stitch (or stitches, as your pattern indicates) into the same location. In the Spring Shawl, you work two double crochets into the last stitch of every other row in the first half of the triangle. 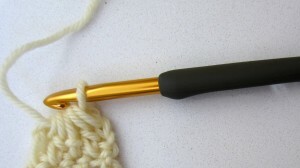 Many crocheters have trouble seeing where to increase. 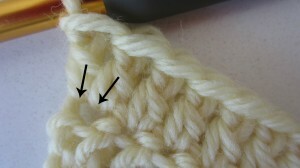 If you aren’t sure, try placing a stitch marker or piece of scrap yarn on the stitch before you begin your increase. The stitch will expand slightly after you increase to accommodate the additional stitches so it will become more visible with each additional stitch that you increase into the same location. There are several different techniques for decreasing, so you should refer to the pattern you are using for specific instructions. For the Spring Shawl, you crochet stitches together. This method is usually abbreviated as st (number) tog where the st indicates the stitch you will be using (single, double, half double, or triple crochet), the number indicates the number of stitches the decrease is worked across, and together indicates a decrease. The first decrease used in the Spring Shawl is dc2tog, or double crochet two stitches together. This is worked over the last two stitches of every other row for the second half of the triangle. Begin working a double crochet in the next stitch but stop before the final yarn over. In other words: yarn over, insert the hook into the next stitch, yarn over, draw up a loop, yarn over, and draw through two loops. Now move on to the next stitch and start another double crochet: yarn over, insert the hook into the next stitch, yarn over, draw up a loop, yarn over, and draw through two loops. 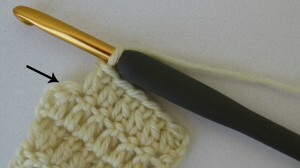 You will now have three loops on the hook, one more than you would normally have when working a double crochet. Yarn over and draw through all three loops to complete the decrease. 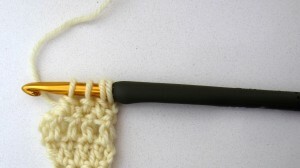 You will see the posts or stems of both stitches angled together with only one loop on top. The other decrease used in the Spring Shawl is dc4tog, or double crochet four stitches together, on the final row of the shawl. 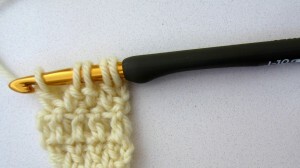 As before, you will begin a double crochet in each stitch, but will stop before drawing the final yarn over through the last loops on the hook. Yarn over, insert the hook into the first stitch, yarn over, draw up a loop, yarn over, and draw through two loops. Two loops remain on the hook. Repeat in the next (second) stitch. Three loops remain on the hook. Repeat in the next (third) stitch. Four loops remain on the hook. Repeat in the next (fourth) stitch. Five loops remain on the hook. Yarn over and draw through all five loops to finish the dc4tog. 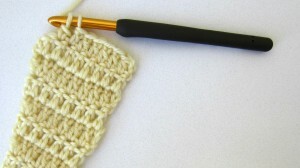 In general, when decreasing, you will end with one more loop on the hook than stitches you decreased across. For example, you will end with seven loops on the hook for a dc6tog. For this reason, it is important to keep a loose tension when decreasing stitches together or it may be difficult to finalize the stitch. I would like to change my subscription to just digital on my iPad. How do I do this. There many charts of hook conversion, I got one I could download at the red heart site. Any site that has yarn and patterns should have a chart. 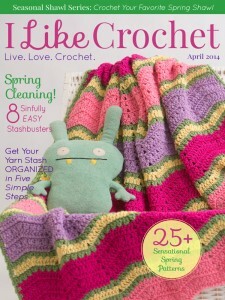 I’m sorry, but I Like Crochet is a digital-only publication. We do not offer printer or mailed out copies of the magazine. Is there a chance to get these mag by mail? 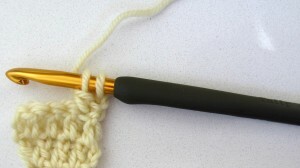 I would like to see you include pictures for left handed crocheters. Is this possible.